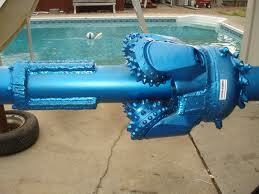 Hole Openers are used for expanding the drilled hole，it is a kind of drilling rig tools. There are many good suppliers and manufacturer of hole opener in China, with good quality and competitive price. Some of the manufacturer produced hole opener according to API standard. 1. When drilling of the big hole is not possible because of the rig capacity. 2. When a satisfied penetration rate is not obtained in case of the big hole drilling, it is used after drilling with smaller bit. 3. When the hole direction most be controlled. made available for various formations to be drilled, such as soft, medium and medium hard formations. Type SM for soft to medium formation,type MH for medium to hard formation and type XH for hard formation. For soft to medium and abrasive hard formations, the cutters with tungsten carbide tips are also available. Fixed Diameter Hole Opener is used to enlarge a hole or connected with a bit on front end to drill pilot hole and enlarge hole. Fixed Diameter Hole Opener is a general hole enlarging tool and is designed for enlarging holes onshore and offshore in oilfield during drilling. It is made of tough heat treated alloy steel for maximum strength. Cutter arms, equipped with removable cutter, are hardfaced and welded on body. The hole openers have three or six jet tubes with replaceable nozzles,so that jet streams quickly clean the enlarged hole. How to inquiry or order the hole opener in China? You need to advice the following information. 4 Fishing neck and bottom neck length and OD. 1 Lilin Group, loaded in Tianjin city. LILIN is the largest manufacturer of downhole drilling motor in Asia area. also famous manufacturer of drill bits in china. The company most significant value is our leading edge technolog ies and engineers that continually innovate and create update product to apply our technology to drilling situations. To know more about hole opener manufacturer in China or other drilling rig tools manufactures, pls contact GN solids control. Hi, I would like to enquire for a quotation of a roller cone hole opener to open from 36″ hole to 44″ or 42″ (or what is the max size available?). We are looking for the following hole openers. Please advise if you can supply.